Arizona Professor: Forget Climate, Humans "Don't Have 10 Years" | Watts Up With That? Arizona Professor: Forget Climate, Humans "Don't Have 10 Years"
While he agrees that climate change is possibly the “biggest issue humanity has ever faced”, he says “giving up is not really helpful”. Instead, Prof Renwick says he hopes Prof McPherson’s 10-year claim will encourage people to take action. It is difficult to see why “its locked in, we’re all going to die” should be construed as a call to action. On the other hand there might be a silver lining to this mass extinction business. With any luck the mass extinction event will take out all the mosquitoes and other annoying pest species first, giving us a last few happy years of bug free outdoor BBQs. November 25, 2016 in Ridiculae. ← EU Pension Funds Now Required to Assess "Climate Risk"
Malthus – Holdren – Falsified. Now McPherson with same claims. At least his hypothesis will be falsified inside 10 years. Doomsday prophesies are always falsified. You can scoff, but Paul Erlich warned you that you’d starve in the 1970s. Just because you dodged the bullet then you’ve been lulled into a false sense of security, but how do you know you aren’t a starved zombie living Erlich’s dream? These people are scientists – they know stuff! Doomsday prophesies are frequently verified by events. It is just that people are often busy and preoccupied and fail to notice. For instance, The End Of The World foretold by the Vikings as Ragnarok, happened on schedule on Nov. 22, 2014. The greatest battle in the cosmos, and in all of times, and people hardly payed attention. Gnome, there should be an “all” between stuff and the exclamation mark. Why does any respectable institution even provide a podium for these nuts? That has been true 100% of the time so far. Neither peak oil nor Malthus can be disproved. Only proven right one day, may be. but how do you know you aren’t a starved zombie living Erlich’s dream? It’s what the individual scientist knows that counts. Like a mechanic, or a politician, or novelist. “Scientists” don’t report en masse. Fifteen years from now the loopy professor will still have his job, and predicting “the end is near”. How do nuts like this get to teach?
. . . handful of Y-2000 bunkers now available at Black Friday prices . . . fully stocked . . . first 100 callers receive genuine reproductions of the Mayan calendar . . . call 1-800-ONO-OOES now . . . . operators standing by . . .
> Doomsday prophesies are always falsified. Ha! Tell that to the poor inhabitants of the alternative universes where everything came true as promised! Back off, man — he’s a scientist! Will McPherson fall on his oracle’s Sword of Damocles when he fails? See Nassim Nicholas Taleb on doxastic commitment and prognostication. Hail TRUMP Victory! Doug: You mean that he can fall UP? See also Taleb’s IYI (Intellectual Yet Idiot). I have a problem with Taleb. He says that the possible consequences of climate change are so great that, if they actualize, we are doomed. He says that should drive precautionary measures. It is possible to dream up an infinite number of cataclysmic chimera. Do we have to protect against all of them? Never mind, we can’t. Anyway, Taleb’s analysis is superficial and he clearly hasn’t researched CAGW. Taleb is not a climatologist or scientist of any sort, so he is arguing from ignorance. He is a polymath but one must separate the gems from the crap. Taleb only thinks one way. I’ve spoken to him when he was a keynote speaker. He pretty much believes that the world is full of positive feedbacks (see 2008 banking contagion) and therefore extreme events are far more probable that you would think. Therefore he avoids any kind of risk, just rolling short T-bills and burns option premium while he waits – think deep out of the money puts on the indices and currencies, CDS swaps on major banks. That kind of thing. He thinks the multiples you make on the events make it worth the wait. That’s fine but not very useful. It leads naturally to thinking in terms of precautionary principles. – the same consequences of CO2 emissions that would have occurred had we emitted it instead of Chindia. I consider my hypothesis at least sufficiently proven by the deindustrialisation of Greece and Spain followed by their economic depressions (and that cushioned by incredible sovereign and bank support from the EUSSR) as to trigger the precautionary principle. The first day the dog runs into a skunk. The second day the dog goes out wearing a gas mask but runs into a porcupine. By the end of the week the dog is wearing so much protective gear that he can’t walk. The book had a big effect on the way I live. I deeply regret that I have forgotten the title. I suspect he’ll feel a Great DIsappointment, regret having spent all his savings and moved to a mountaintop, and eventually get over it. Remember when Richard Glover called for deniahz like us to be tattooed? Did I say tattoos? I meant medical bracelets. He might think so, but that’s probabilistic illiteracy writ large. You can never avoid all risk, because the very act of avoidance inevitably costs you something, and a cost is a special case of risk (where probability = 100%). All a rational organism can do is to try to minimize its NET risk (or, for completeness, its NET [risk – expected reward]). Are professors vermin? Should there be a bounty? Of course, climate charlatans always fall (fail) upwards! Varmints, perhaps. They have bounties on these in Texas. Malthus was not “falsified.” The “prediction” he made required that there be no increases in productivity or energy supply. If those had not eventuated civilization might indeed be in a sad case. Nearly all scientific predictions really carry the subtext assumption “all things being (or remaining) equal…” and then a prediction based on knowledge current at the time of the prediction, which historically is incomplete and generally wrong once you reach beyond the behaviour of specific phenomena into the complexities of the real world and time-varying reality. This “prediction” by McPherson is not scientific; it assumes things like habitat destruction so severe planetary biology would utterly collapse in 10 years; it is absurd. More stupidly it links climate change and habitat destruction as if the former causes the latter. The “prediction” silly beyond words; the moronic bit by Renwick is even worse. If things really were that bad “taking action” would yield exactly nothing. One trick modern psyentists malthusiastically borrow from their intellectual progenitor is this tactic of eschewing escatological predictions in favor of so-called projections. While the amateur con artist naively predicts that Four Horsemen will be coming around the mountain by next Tuesday, the psyentist is careful to predicate all such prophesies on the assumption (“scenario”) that Three Horsemen have already arrived and are currently slaking their thirst at the local saloon. Being now 70 years of age, 10 years would be about right; 20 a stretch. Not trusting just any old person—only the experts. Not doing what the experts say at first, because you’ve been hurt before. Still not doing what the experts say 25 years later, even though they’ve been unanimous and consistent in telling us the same scientific message from the beginning: that we have months to act, if we’re lucky. Brad, you sir are what is known in the trade as a moron – unless there was a missing sarc tag on that comment. Your definition of skepticism is your first indicator of moronity, as a skeptic trusts only the data he can verify as true. There are no such thing as experts to a skeptic. A cynic is one who does not believe that what he can plainly see is true because similar things were shown to be false before. He differs from a skeptic only in that he will not test the new data himself. Your definition of denihilism once again relies on the false construct of experts. Experts are those who convince themselves that whatever they see supports whatever they believe and have been told to be true. The fact that they have been saying for 25 years that the world is doomed in the next decade is proof of their lack of credibility. Only the skeptic performs any science at all – and he is never fully convinced. Owen, I’m surprised my reputation hasn’t preceded me far enough to make your acquaintance. If I have some special reason to make a non-ironic comment, which happens once a week or so, then I append a tag. Otherwise a large grain of salt is just what the doctor ordered (though cardiologists may disagree). I think you’re too hard on cynics, BTW—they don’t really belong on the denihilist/gullibilist spectrum, except jocularly. Also some experts are expert. They may contingently be inept in some fields, but that’s not a matter of definition. But *in science,* what you point out is certainly true: expertise doesn’t impress skeptics, because skeptics (being devotees of the scientific method) are moved by evidence, not by credentials. I’d also quibble with the demand that skeptics verify *data* with their own eyes. That’s astronomically onerous. Nobody does that, or is expected to do that. Anyway, the general direction you’re thrusting in with those distinctions seems right, notwithstanding the details I objected to above. Thanks for such a detailed reply though. It’s always valuable to know someone’s reasoning steps. It wasn’t wasted, even though we’re on the same broad “side” of this. There was meant to be a /seriously at the bottom of my reply to you (I just mistyped it). skeptics *do* take data on trust, all the time, in all sorts of domains/problems/topics. It’s a necessary evil. Life is short. And unless the other guy has literally doctored the observations themselves, it’s usually not a problem. What’s important is that you never take the *conclusions* on trust. Never believe that a *hypothesis* (or theory) is true just because someone else thinks so—always ask why they think so. This question (Why?) cuts to the chase: evidence. Having said all this, I don’t want to downplay the importance of having SOMEONE verify the data. And if a scientist refuses to cooperate with that “someone,” it should ring alarm bells. I’m just disagreeing with the idea that EVERYONE has to verify EVERY bit of data they take into account (when forming their beliefs about the world) with their own eyes. The single greatest dishonesty of the CAGW crowd is the 100 years to doom prophecies. In 100 years the 5 people still living will be suffering from Dementia. Let us remember his words and perhaps he will be gracious enough to eat them within 20 years. Is dear professor McPherson willing to put his money where his mouth is? I’ll bet him $500,000 world human population will still be over seven billions ten years hence. I have to wonder if he is very old, and figures he won’t live to see his prophecy proved wrong. I recently saw something to the effect that (some of) today’s Anarchists are just communists in another form….? That’s funny, Marcus, and true. It appears Professor-emeritus Guy McPherson of University of Arizona needs to get a little psychological therapy. He will really be embarrassed with himself, once he has the realization of just how ridiculous he sounds. Just think of all the poor kids this guy has confused over the years in his classrooms. And the poor parents throwing their money away on his kind of education. The University of Arizona ought to reevaluate this guy. The parents of University of Arizona students ought to insist on it. Do they want a delusional “Doomsday” prophet teaching their kids? As a result of Trump’s POTUS win, me thinks that Professor-emeritus Guy McPherson of University of Arizona has seen the “writing on the wall” and is accurately predicting ……. the extinction of most all “troughfeeding” Climate Scientists within the next 10 years. And intelligence does not mean wisdom. Well, generally it means intelligence. But it doesn’t mean sense. Sam, there’s a whole range of options between no government and one world government. That’s the secret of predictions, make them so far ahead that one will either be retired or dead! That way they never have to face the music! He says… “…we’re in the midst of our sixth mass extinction” . If we are in the midst of it, it’s curious that nobody has noticed that it is happening. It is well documented in the biosphere that due to himan activities, that a mass extinction evemt is ongoing. This is not doom and gloom talk on my part, but over fishing is real. In moat of the world, animal population is way down. There are and will be.sutvivors, the animals that learn to live well in ourenvironments. In the US, that means deer, bears (black/brown),coywolves/coyotes, birds, rodents, etc. Certainly many others, but only the ones that can adapt or survive in the spaces we leave for them. Mike: It has long been posited that the cockroach will inherit the earth. Can’t kill’em. Nope, there is no “mass extinction” happening. All claims are based on computer models built and tortured from programs not intended for extinction-type studies. My favorite model is one that predicts how many species, which we have not identified yet, will go extinct before were ever identify them—it’s like they never existed. You can basically put in any number you want; sort of like the climate data adjustments, they just make it up out of thin air. The claim of real extinctions or an increased rate of extinctions has nothing to back it up, no data. Let’s not forget polar bears. I suppose you are prepared to deny that the Dodo, Passenger Pigeon, Great Auk, or Tasmanian Tiger are extinct? Or that Grizzly bears no longer can be found in California or the Great Plains. Or that there are serious declines in the populations of elephants, Black Rhinos, or Bengal Tigers? There are no sabre toothed tigers, diplodocus, T Rex, mammoths or archaeopteryx either. I guess our guilt as a species goes back millions of years. I don’t know, Jim. Cockroaches can be killed. The real unkillables are fruit flies. Even the pros have nothing; you have to convince the little buggers to commit suicide. It is well documented in the biosphere that due to himan activities, that a mass extinction evemt is ongoing. The only extinction going on in the real world is the Greens destruction of birds in their choppers and fryers. No, the mass extinction would have occurred had we not begun fertilizing the atmosphere with CO2 in the industrial revolution! It would not have needed much of a downturn to bring the CO2 level below that required for photosynthesis and that would have led to all life on earth dying. 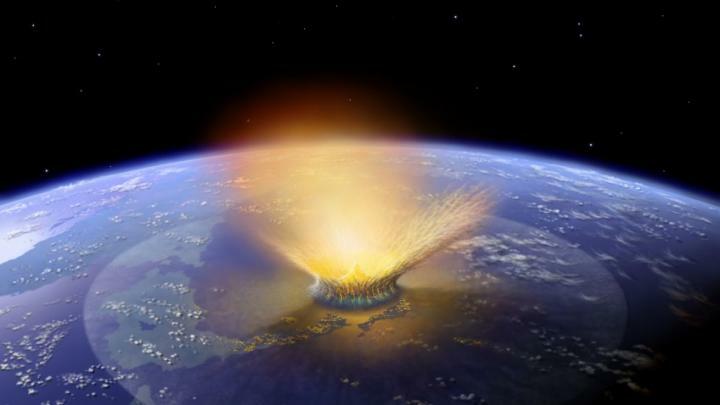 Man may have actually prevented the mass extinction. Oh yeah, so easy to misplace half the world’s rainforest. Only the pathologically incurious could have failed to notice. So Tony, where have you noticed it, or are you only taking someone else’s word for it? Or making it up? Do you even have a definition of rainforest that means anything? Oh yeah, because climate change did it, or maybe because we burn the food in cars? Now I see here and there huge old trees being cut, just to be let to rot on the ground to enable young trees to take more CO2 out of the air… Another great green idea. Last time I checked increased CO2 would not harm the rainforest, just the contrary trees grow faster with more CO2…. Only the pathologically ignorant could have failed to notice that rain-forests have replenished themselves over and over. Case in point the ecosystem devastated by the Mt St Helens eruptions. Incurious indeed! Read a book, or check out a documentary. Europe is removing their forests.. for biomass. DOH ! I chose rainforests because they are the most bio-diverse terrestrial ecosystem. Half the planets tropical rainforest has been destroyed in the last 50-60 years, but there are plenty of non-rainforest species that have become extinct. Many of the Australian mammal extinctions have been dryland and even desert species. I live in an area that has lost a lot of its sub-tropical rainforest. Australia has lost 95% of the tropical lowland rainforest. Thousands of species went with it. I’m not blaming anyone, just pointing out the facts. And if you don’t think any of this really matters then I would urge you to reconsider your position. Were they destroyed due to climate change? Hey haven’t you heard that polar bears have gone extinct; several times recently !! It’s the canary in the coal mine , etc. are you blind ?? So Greg, are you saying that we’ve heard several times of the one extinction event of polar bears, or that they have gone extinct several times and we’ve heard it each time? The latter is closer to the goo-goo unreality of climate panic. It reminds me of that joke – that economists have correctly predicted 17 of the last 2 recessions. In fact, polar bear populations are burgeoning. Check Susan Crocker’s site or Jim Steele’s wonderful articles at WUWT if you want to learn some actual facts about polar bears and their environment. As to the population of coal-mine canaries, I’m not so sure. I think Greg forgot to indicate his post with the sarcasm indicator tags. Don’t take him so literally. I believe the coal mine canary IS extinct. I hope you’re being sarcastic…sometimes I cannot tell. Greg, We know you are stupid, inane but why write comments just to prove it.? …He says… “…we’re in the midst of our sixth mass extinction” . If we are in the midst of it, it’s curious that nobody has noticed that it is happening…. Have YOU ever seen a rainforest? I haven’t. Or a Polar Bear in its natural habitat. So maybe they have all just disappeared and we haven’t noticed…. Ever been to the Pacific Northwest? That is a rainforest. Well, I have seen a rainforest on the Olympic peninsula. In fact, I put up a tent for me and my family in a nice level spot one night only to be awakened when we were in the middle of a creek. Never, NEVER assume that it will not rain in a rain forest. Cost me a mint in dryer fees for our sleeping bags. Much of the PNW is dry. Seattle gets less annual rainfall that Dallas, I live about 80 miles north and we get even less. Sure there are a few rainforests here and there, but to say the PNW is a rainforest is pretty off. Yeah I HAVE seen a rain forest. More than one. But not a polar bear. Jeff Alberts- Winnipeg Boy is referring to the Canadian NW which is a rainforest! For the last 12 months the Dallas area and the Seattle area have each received 43″ of rain. The Olympic Peninsula has received 274″ during the same period. One of those would be considered rainforest. Seattle has also had a much wetter than average year. Our usual avarage is about 36″ last time I looked (Actually just looked, and the average at this site shows 34.1 for Seattle). I live on Whidbey Island, which gets about 21″ annually. I doubt the entire Olympic Peninsula got 274″ of rain. That’s a very large area. Certainly parts of it might have gotten than much, but they’re outliers, not the majority of the area. And if you go east of the Cascades, well, that’s much drier for very large swathes. The annual precipitation on the Peninsula varies greatly upon location. The southwest portion of the Peninsula (Quinault, Queets, Hoh) is the wettest with an average rainfall of over 140 inches in the lowlands and over 200 inches in the higher mountain elevations. So yeah, a small number of high elevation spots MIGHT get over 200″, but that’s a small fraction of the peninsula. Yes Jeff Alberts, that was max rainfall for an isolated area of the Olympic Peninsula and would not be representative of the entire area. I was at the Naval Station on Whidbey Island 30 years ago, beautiful area it is. My Aunt lived there for about 8 years, but it was too cold for her and she moved to Laguna Beach, CA. @Richard – I’m a stone’s throw from the NAS (well, a rifle-shot maybe). Yeah, doesn’t really get warm, doesn’t really get cold (with a few exceptions for both). It is beautiful, but not a great climate for everyone. 2) you don’t get naming rights for finding another race of an existing species. The money shot comes from naming a new species. When one of these pools of otherwise quite common fish dries up, it is claimed that yet another species has gone extinct. Another example is that the Australian Dingo has been claimed as a different species because it looks slightly different from the common domestic dog, even though it interbreeds freely with them. It is yet another instance of bad science being used to blame humans for all the ills of the world. You are totally making this up Lol. Another example is that the Australian Dingo has been claimed as a different species because it looks slightly different from the common domestic dog, even though it interbreeds freely with them. “claimed as a different species” Claimed by who? For what devious reason?? “Another example” of what exactly? Oh I get it you’re just anti-(bad)science… bad being anything you don’t understand. hasn’t it occurred to you that the *reason* extinctions are happening so few and far between might just be that there are few—if any—species LEFT? How many species, in the wild, have you seen recently? I’m not talking about species in captivity—which rarely breed anyway, because they’re not attracted to each other—I’m talking laying eyes on an actual wild species? Full Linnaean taxonomic designation, please? “Endangered species” is a lie, made up by Republican spin doctor Frank Luntz, to lull us into denying the awful truth: species may ALREADY be a thing of the past. Willis wrote a great article along the lines of “show me the corpses”, citing the “Red List” of endangered and extinct species. Worth a read. The other issue is that the estimates of how many species there are/were is only correct to an order of magnitude. Mammals, birds? a fairly good idea on the number of species. Insects? no one has the foggiest bloody idea. if you can point me to a living exemplar of Santer’s dormouse (m. ianuarius Santerii), I’ll take an open mind towards your skepticism. But don’t be fooled by the blood and guts. M. ianuarius wants predators to think it’s playing dead, and the ultimate predator is you, Man. But this cute, four-legged living anatomy lesson has a cunning trick up its sleeve: it actually is dead. Think of it as a case of thanatosis imitates thanatopsis. And it hasn’t been seen alive since 1996, when suspected Republicans in a yellow Humvee deposited the last specimen on Ben Santer’s doorstep. Brad, I fart a lot. Get over it. That’s no need to talk about it. It just sends the wrong message—that that kind of biological necessity is somehow ethical. Your copious flatulence is, if anything, even more reason (morally) why you owe it to the world to do something about it, like join your local counter-wind movement. Hypocrisy is the tribute vice pays to virtue. I saw a species once. Ran over it. Who needs ’em I say. Plants actually grow more with fewer species chewing on them. I find a great way of minimizing my impact on the environment is to avoid hitting it, wherever possible. Alas, and only extinction will make an impact here. You sir is what is known in the trade as a moron. The species that are going extinct are mostly isolated island species. They are mostly being killed off because of the introduction of cats or rats (though sometimes snakes). This is simply speeding up what has been happening for millennia. Highly specialized (i.e. very few viable genes) isolated species are out-competed by their very generalized (genetically multiplicit) cousins who insinuate themselves into the specialized niche. These more generalized species infrequently (but not 0 probability) colonize remote islands through driftwood and storms and have been a problem for the established species all along, and when it is a breeding pair wreak havoc on local species. We just provided a more convenient ride. They have yet to be able to attribute a single extinct species to climate change. They thought they had a snail species a couple of years ago (to sea level rise on a sinking island that was under water during the Roman Warm Period – unless that didn’t exist after all despite the geologic evidence to establish it), but it turned out it was just rare to begin with as only a few examples had been seen earlier and then none for many years until one showed up. Er, I meant no TRUE mammals lay eggs. And no TRUE swans are black. The thing you have to understand about Australians is, they’re great practical jokers. If you think they wouldn’t put fake eggs in a mammal’s lair just to take the mickey out of 200 years of biology, you’re incredibly innocent. Australians do that. And Americans are their favorite targets for pranks, p**s-takes, mickey-takes, wind-ups and larf-haves. Because of all the world’s species, h. sapiens americanus is the only person over whose head the lowest form of wit (sarcasm) manages to fly. H. s. americanus is like a living, breathing limbo stick for joxe, pranx and sarx of all kinds. I’ve been called many things in my life, but “sir” is not one of them. I’m not a member of any order of Knights in any heraldic system on earth. You take that back, please. But thanks (/seriously) for the zoology lesson. I’d heard of this embarrassment with the magical-vanishing-reappearing snail—can you remind me the name of the snail species in question? When an American says he saw a “possum,” he means an opossum, right? Are true possa found in America (or anywhere outside Australia) and how closely related are they to opossa? AFAIK the last living Santer’s dormouse was found, dead, by Ben Santer in 1996. If that species doesn’t count as The First Casualty of Global Warming, I don’t know what would! By 2020, two-thirds of wild animals will be gone. Life is being extinguished as fast as when the dinosaurs disappeared — and it’s happening because humanity is taking a chainsaw to the tree of life. Unless we stop this tragedy, the Earth’s delicate biodiversity could completely collapse, leaving our planet deathly silent and uninhabitable for humans. But an ambitious plan to put half our planet under protection could restore harmony with our home and stop the extinction. Top scientists back 50% protection and governments are meeting in days to negotiate a way out of this crisis. If we bring a resounding chorus of human voices behind the plan, we can push our leaders to act. Human pollution and greed are collapsing mangroves, forests, and coral reefs across the world, wiping out all kinds of species, and putting ours at risk. Scientists say we’re close to global tipping points, beyond which ecosystems cannot recover. They’re calling for a long term goal for nature — to protect 50% of the planet from deforestation, dirty energy, and industrial fishing and agriculture. If we get governments to agree to it, we can save 80-90% of all species, and safeguard the critical role biodiversity plays in sustaining life. 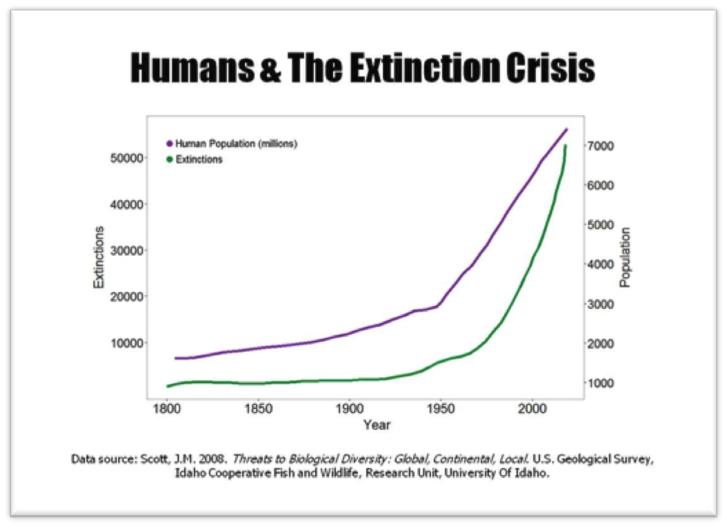 The problem is the extinction crisis is not high on the political agenda. But in days we can change that — governments are meeting for the first of 3 major summits, and we can show them that people overwhelmingly back this plan. Let’s start today with a massive petition for 50%, and keep building the pressure until we win! It is a great unwisdom of our species, that we have become so disconnected from our natural world. But it’s not too late. We have the capacity to grow wiser. Our hope for change built this massive movement, and we won the Paris climate deal. Now let’s come together, lead, and restore the harmony between humans and our home. Tts not talking about species extinction, but a diminution of the number of extant animals in each species. That in turn is driven by human population increase and expansion into wild areas, not by climate change. We are the masters of this planet and so it our responsibility to maintain biological diversity and we will do that without committing suicide as so many deluded liberals want. Of course, we can’t let the bunny rabbits overrun the place so hunting must be permitted and, sorry to say, regulations are necessary, but the best people to do this are the hunters themselves. What makes my neck hairs stand up is anyone who says “we must do this.” Exactly who is “we?’ Usually some ersatz group seeking political power eventually encompassing everything we do. That is why rule by dummies (Democracy) is the only acceptable order. Shame NZ had to be mentioned but if this wanker believes that he needs to be locked up in an institution as they would have done years ago. Totally insane. Wow – we actually dredged up someone who believes the nutcase! Get a nice doctor to prescribe you some Thorazine, friend. If you’re wrong, you’ll find you’ll feel a lot better. And if you’re right… well, you’ll still feel better, so what have you got to lose? As you say, in your view there’s no hope anyways, so why not give it a try? That Tin foil suit is a bit tight on you. And I just thought he forgot the sarc tag! WE’RE GONNA DIE!! WE’RE GONNA DIE!! that’s true, but please try not to sound so malthusiastic about it. Here we have a refugee from the recent past – back when silly claims about methane exploding and choking the atmosphere and an unstoppable warming were the claims by ignorant alarmists. But that was back in the 1990’s, before people knew what a crock of bull worries about methane really were. We know the history of the world’s climates well enough to show how such events as alarmists put forward have occurred in the past and , guess what ? The polar bears are still a living species, there was no runaway warming due to permafrost melts , etc. I call this stuff the doomsday imaginationary fears that are , at this point, illogical. Global temps have barely budged in 20 years and yet this guy claims there is runaway warming. Go figure. I sit slack-jawed in amazement at Kirk’s nonsense. He must have taken the Kool-aid undiluted. Wow. Just wow. I was going to berate everyone else for mocking this Kirk guy instead of providing factual information to refute his claims. But then when I sat down to do it, I realized…. Wow. Just wow. But I will take a stab at it. First Kirk, you begin with a cherry picked time interval to claim your temperature rise. I didn’t bother to check the actual data, but basically it looks like you’ve captured the temperature burp from the last El Nino, and then tried to extrapolate it into the future. If that logic was true, then everything you claim is about to happen as a consequence should have happened in 1998 and we would no longer be here to discuss it. But it didn’t, because the earth cools after an El Nino, it doesn’t just keep warming. Second, your 60 feedback loops are just silly. If they existed, we would have experienced them in 1998 after the exact same type of El Nino conditions. But we didn’t. In fact the opposite happened. The earth cooled and we experienced 20 years of no temperature increase at all beginning from before the El Nino started! You see Kirk, positive feedback loops are virtually non existent in nature. Negative feedbacks rule. The earth has actually been warmer in the geological past than it is now, and no run away warming occurred. the doomsday frenzy seems to be a positive feedback loop. By that logic, it should have happened the first time there ever was an El Nino, or warming of any kind, really. This is what you get with the fallacy of a global temperature. Have some ice with your cool-aid, it will add a year to the 10 you have left. between the hours of 3AM and 3PM, the temperatures rose over 30 degrees F.
it that continues at the same rate, in 4 days i will be parboiled. it’s worse than the wurst! want to break that feedback loop? don’t swallow your own poop. @Kirk Brent: Brent, you went off your meds again, didn’t you? Don’t you remember what your doctor said about staying on your meds if you are to get better? You don’t want to go back to the institution, do you? And by the way, have you ever heard of something called a paragraph? Your rants are easier to read that way. According to Wood for Trees the temperature has fallen 0.45 degrees C from january till now. This means by your logic that the temperature will be at least 6 degrees C colder by 2030. In RSS the most recent 8 month change was -1.17ºC. So in the next 13 years to 2030, the temperature will DROP by approximately 22.8ºC !! You do realize that Andy is not charging you by the paragraph. Seriously, there’s nothing more rantsome than a sesquipage of unbroken text. Holy spit KB! WE’RE DONE FOR! Would you kindly give the boys a call who’re spraying (nee: nanoing) earth with aluminum, strontium, barium, and other witches brew under the moniker of saving the planet? LET ‘EM KNOW IT’S TOO LATE! They’re just wasting time, fuel, sunlight and earth’s IQ trying to put the soft good-bye on the immuneless and The Big Hurt on the rest of us soon-to-be crispy critters. mate we wont survive a 5c difference? 1 The Copenhagen Climate Talks were held in December 2009 about 7 years ago not the 25 years claimed so if you cant even get that historical fact right why should we believe anything else you write? Time to take the *emeritus* away from him. Emeritus? That’s someone with emerrhoids, right? No reason not to keep on…. We can always play the fiddle as the world burns — preferably McPherson’s Lament. Dash it, beat me to it! Julian, would I have to travel to Ireland to get a sweater like that? Google ‘Arran sweater’ and pick the nearest outlet. Make sure your bank balance is solid. What a fine idea. Let’s have a nice Irish singing fest while we hang Professor McPherson. Although I suspect it will have to be only in effigy, I think there is a law against killing idiots in this country. Thanks, Professor McPherson! I’ve been looking for an excuse to cash in my 401k and buy a Ferrari. … and Heathrow’s 3rd runway, and HS2, and all the other projects that will take 10 or more years. Hey, is that a Slaughterhouse Five quote? So there is an overwhelming consensus there is nothing we can do, so lets take an action. Put a tax on plastic shopping bags! Eat, drink and be merry for in 10 years we die. I think the word “emeritus” has lost its meaning. more like ameritus in this case. I am partial for demeritus. Well, since in some words “e-” means lacking, e-meritus means without merit. Would this have been an appropriate reason to have been tarred and feathered in the olden days in some parts of the world? Someone with a longer attention span than mine should look into what this character said ten years ago. He has been spouting this rubbish for years. He is a 24 carat lunatic. Since the human race will have ceased to exist in ten years time, then purely as an academic exercise would you like to sign over to me all your worldly goods, effective Nov 25, 2026? No? I wonder why not. I suspect, Professor, that you don’t really believe in what you are saying, but are merely another washed-up academic looking for attention. You and most of Hollywood. I bet he hates Ducks, as they talk about him incessantly. Flyoverbob’s remark gave me a chuckle this morning. How many straitjackets do you need ? He maybe correct in his assumption, president elect trump may make his job and by definition him extinct alongside of his religion. I am so glad he put everything in perspective for us. No more need to worry about the little stuff. (The End Of The World As We Know It) Telling that it should have it’s own acronym. SMOD arrives, and the CAGW crowd was right all along. It really was Worse Than We Knew, and we really are All Going To Die! Try to remember: Once the TEOTWAWKI’s were human, as human as you and I. What are the odd it won’t happen.I think I’ll put a few thousand on that? Since 30 years of crying wolf has not worked, he obviously decided it would be more effective to cry WOLF, WOLF, WOLF !!! yeah, right. NZ does not account for squit in terms of global CO2 but they are “not doing enough”. Hey, they’ve manipulated their national temperature records, what else do you expect them to do? but it wasn’t the international community, they don’t even remember New Zealand exists. It was New-Zealanders, of course, asking for international backing. This is some very typical autohatred thrown in by antinationalist / internationalist / xenophilic leftist forces. It doesn’t matter what others have or have not done, what matters is some comrade who has expressed an opinion, hating one’s own nation. They use NGOs and international big green like the UN to get their own message echoed. ‘Look’ they say, ‘what international community thinks about us’. As if it cared. These people really needed some head-shrinking. This is not to say we don’t need the comrades in the UN. We just have too much of it. Right… Because those mass extinctions run on a very tight schedule. So, this clown at the U of A (my home school!) thinks we are roasting to death? This newcomer to Arizona (we have lived there since the Civil War) thinks it is hotter today than say, 1955? HAHAHA. Well…this man isn’t a scientist, even! He is a ‘cultural critic’? And this fool moved to New Mexico to ‘live off the grid’? I bet he knows all about what happened to the Tribes there back in 1200-1400 AD, that they all died or had to flee due to the 200 year drought? This end of times clown gets published all over the place and now FLIES across the planet, creating vast oceans of CO2 and he also exhales when yapping at us…and he is scared this is going to cause the planet to end all life? Why isn’t he walking everywhere, no? And since he is in New Mexico, I bet this winter he is burning something off the grid to stay alive, and we know what that is. I try to respond politely to professors and everyone else. But this is a “Bridge too Far”, an end of the world prediction that is as screwball as any nut walking up and down the street with signs saying, “Repent Ye, the End is Nigh”, more or less what Al Gore has been telling us, minus the climate theme and the collection box at the church door. Every year for the last 30 years, the End of Times is a mere 5-10 years away. As each due date fails, they double down and scream louder. It won’t end except when they all freeze and it is so cold this fall, I am expecting the End of the End of Times whining to cease by February when they are all encased in ice. But think about children! The seas are boiling! Hopefully their homes will be powered by windmills and solar. May they freeze in the dark. But there is a collection box . This man is jetting around the world , using the fruits of an advanced industrial civilisation ,to promote,and make a lot of money from , his latest book about the need to destroy industrial civilisation. Clearly an extreme case of PTSD, Post Trump Stress Disorder. If all the snowflakes that were “literally ” going to die if Trump was elected, got on with it, our population could at least enjoy our last 10 years in peace. Since I’m extremely white, I’ll complain on your colorism. There people are no snowflakes, dust bunnies could do well, since you want to get rid of them. Probably has some serious mental health issues. Let’s not pile on. Aw man. Ten years means I still have to teach my daughter how to drive. Why couldn’t it be eight? Yes you can! The sea levels are already healing up for the ninth year. This will go down as another one. Too bad Wiki doesn’t list the doomsday of polar ice, which apparently all vanished several years back, as another doomsday prediction. And Wiki fails to list the soon-to-occur global “Great Flood” event, which will wash away and drown all of Humanity’s “eco-sins,” just as soon as the ever so increasing rate of sea level rise gets into gear… maybe folks in AZ and CO can invest in ocean-front property? Are you sure this is not one of those ‘fake news’ sites designed to gather click throughs while serving sad to you? Something so stupid cannot possibly be for real. Watched the video, as far as I can tell the prof really said we’ll be all gone in 10 years. If he reckons ten years is all we have max…. Then two years should see absolute confirmation of his prediction. Temperature would have to be going up rapidly by then… Heck, we’d start seeing it in six months. We’d be seeing it now actually…..
What a fool. How the fuk did a whole political establishment end up listening to fukwits like this guy? These people have ruined the lives and livelihoods of literally millions of people…..Grrrr. Now I’m angry. Be patient J.H. It will all be over soon. In 9 years, 11 months and 30 days. Cough, cough, um, er…ah forget it. We can hypothsize about McPherson’s mental state, but make no mistake; what he espouses is pure evil. There is no other way to describe it. His point of view is that extreme and that anti-human. So, did you join with the other dead people and vote in the last election? I wonder if he’ll give us a ten year extension on 1/1/ 2027? The post is mislabeled. Friday Follies would be an accurate heading. https://www.youtube.com/watch?v=L9UXKOIvuYE : Marshall Herff Applewhite created a religious cult commonly known as Heaven’s Gate.In 1997, he led his 38 followers to commit suicide in hopes of being transported onto a spaceship traveling with Hale-Bopp comet. Everybody assumes they killed themselves for nothing, but what evidence do we have that they are not having the time of their lives on Hale-Bopp right this very minute?? And they were all wearing Nike tracksuits. This prompted one wag in the media to suggest that Nike should consider changing its motto to “Maybe you should think about it first”. Hahaha! You must give it to them: they have a sense of humour, or is it a sense of the absurd? Guy McPherson is 56 years old, sort of age where, if a family man, you carry life insurance. I wonder if he has informed his broker that he is going to die before he is 67? I may not be here to see it but I’m confident that humanity will survive longer than the next 10 years! This Prof should be forced to commit to forfeiting all his possession if 2017 rolls around and humanity is still here! I’m sure he doesn’t have the guts to make that pledge! Typo – in 2027. Sorry! Let’s not go crazy everybody. He didn’t say 10 Earth years. It’s actually 20 years til Apophis. I hope Professor McPherson quickly gets the psychiatric treatment he so desperately needs. After he is placed on permanent sabbatical for his delusional need to promote anti-scientific fake news. I couldn’t care less about the good professor’s fears for his own life, or the earth’s, but he teaches (molds?) young minds, as do many others who profess this doomsday nonsense. What of the kids, some as young as five or six, who are being fed this line of bull? If you desire anarchy, teaching hopelessness is a good way to seed it in. People like this need to be brought to heel. Hopefully severe budget cuts are on the way and will do the trick. This looks to me like a compelling bit of evidence for why tenure is a bad idea. Guys like this used to wear signboards and long beards, and wander around the downtowns of major population centers. When did they get so normalized as this? Since we are all going to die in 10 years, we don’t need the University of Arizona any more, or any university or school. It would be sensible to just shut them all down. I’m certain that McPherson would think this would be proper. McPherson’s website reads almost identically to that of a UFO promoter. Additionally, the esteemed McPherson writes in his letter to the future that language, writing and civilization are the fundamental mistakes a species can make, because they lead to such terrible assaults on the environment. He is not merely a pathetic misanthrope, he is not simply a hypocrite of the most cynical sort. He is above all a shallow bloviating ignorant twit. I’m curious… McPherson has reached “emeritus” status at the advanced age of 56? (born in 1960). Most professores emeriti I’ve known have been gentlemen (and gentlewomen) in their 70s and 80s. I’ve gone through McPherson’s website (guymcpherson.com) and he seems a bit, er, ‘off.’ Has he perhaps succumbed to some form of early onset dementia, and been “put out to pasture” by U of Az, hence “emeritus” bestowed as a means of relegating him to an early retirement? Here’s his story of ‘retirement’. In every detail, he appears to be a deluded communist. Well, communists usually are. They probably got tired of all that “gloom and doom”. Professor McPherson probably wasn’t much fun at parties. Actually it is the perfect advice to give the faithful. Stop worrying and live your life. What did you expect? A fellow who spent twenty years pushing CAGW to suddenly say “oops” never mind. So now after a career of shoveling the stuff, its now time for a quiet retirement; where you don’t want your now out of control minions tearing down the standard of living you have come to enjoy. Tell them its to late, live your life, and don’t expect anything (like self-sacrifice) from me. This nutjob has been writing this garbage for years. None of his academic contemporaries takes his message od doom seriously. He is 56 yr old, and can be put in the Wadhams category of fruits and nuts. His fellow serious academic ecologists actually laugh behind his back. Laugh they may, but this nutter does publish books that sell because there are plenty of people who buy into every “End of Times” theory and his academic credientials adds a false air of authority. And because he is published and read, and makes a good living off his nutjob theories and proclamations, he can take “Emeritus” status (retired) and the university doesn’t have to pay him. The emeritus status falsly elevates his stature among gullible and ignorant reporters who breathlessly are writing click-bait stories, and other academics who use his nutjob status to gain attention. I guess I should refer to myself as Facility Manager Emeritus, SIUE (LOL). Especially if there’s only ten years left to say it. I judge by his mien that he is thoroughly enjoying his little joke while the Chicken Little crowd puts the tingle of the jingle in his pockets. He has been doing peak-oil doom anti-capitalist tin-foil stuff for at least ten years, and in 2007 there were to be only a few years before the collapse will come. In ten years the few has grown into 10 years, so basically he’s learning the nigh in end-is-nigh can’t be too.nigh. Technically we have less than ten years now that time has passed since his prophesy. I’m just glad to know that I’ll be gone before my warranty on my water heater expires. I feel strangely liberated. Off the hook. I suspect that Professor has the same tailor as Saul Goodman’s brother. A well made suit lined with tin foil. +1 Can we accelerate the schedule? My water heater is due to go any day now. Professor McPherson’s Emeritus-ness has pumped up his capacity for displaying academic vanity. Anyone who makes predictions of the future is showing their arrogance, soon to be recognized as ignorance. Even Nostradamus. If you really believe your BS, “professor”, there is no reason to be teaching anything. What’s the sense of it? Quit your job and go spend some time communing with nature. By the way, you don’t need any money you might have saved. Show your sincerity of commitment to your claim by giving it all to the poor so they might enjoy what little life they have left. The world is getting better. Doomsayers often don’t use data, or project a trend into the future forever. And PETM (+ 6deg C over HCO) was ***only*** 56Mya. I’ve never seen a such a series of posts so desperately in need of the /sarc tag. When Leif shows up they’ll have to toe the line. At least your comment has the proper tag. I’m wondering exactly how much the temperature must rise to cause a mass extinction. Out here in Colorado Springs I do know that I am currently freezing my a$$ off, but we’ve had a warm and very dry fall. We don’t have to worry about the lack of precipitation for a while — our city just completed the Southern Delivery System (SDS) to take care of our water needs during extended dry spells. I’m not sure if CO2 has any effect on the climate but it sure seems have caused a lot of people to completely lose their minds. Or are they holding their breath? Maybe their loss was a loose mind to start with. Psychiatric counseling and care is in order. How can supposedly smart people actually believe this? He’s mentally disturbed and a danger to us all. Lock him up. When your pay and future pension depends on it. In that case, why doesn’t he put in for early retirement and cash in his pension? Strange he does not see himself in that mirror. Boy, Pamela, and I thought Rapture Ready was the strangest end-times site. Yours really has that beat! I like how they throw out a Bible quote that can mean just about anything, or nothing, and it somehow reinforces what they’re saying. I was once asked to debate Guy McPherson, and I raised objections with the moderator before the debate that the ex-professor believed some pretty bizarre things. The moderator countered with “no he doesn’t, those are just things other people write about him” So I agreed, but the very next day, the very same bizarre things I objected to were in full view on McPherson’s website. That is the first and only debate I ever walked away from, and I’m glad I did. McPherson is about as credible as Harold Camping and a host of other doomsayers- useless fear mongering. I am pretty sure the world has already ended, but the computer models have not caught up with this reality. As soon as the models show humanity is extinct, then it is official, and the professor can report we are all extinct. Sarcasm aside, the concern on the left should be the continuing growth of mass stupid on the left. That definitely leads to mass extinction of not humanity, but of leftist politics. Evidence of this is the democratic party in America in full meltdown losing every branch of government there is to lose. House, Senate, and State Governors all have Republican majorities. The judicial court will soon become slanted conservative and of course the executive branch is now the playground of Donald Trump. You’d think this would be a reality check…but noooooo, their political platform seems to be that global warming is killing everyone not being put into Nazi concentration camps built by Trump Industries. I heard a report on tv the other day that said of the 5,000+ total counties in the United States, Trump won all of them except for the 300 Hillary won. As of 2013 , there were 3,007 counties, 64 parishes, 19 organized boroughs, 11 census areas, 41 independent cities, and the District of Columbia for a total of 3,143 counties and county-equivalents in the United States. When will the guy receive an honorary FRS ? Oh yes, in 12 years’ time, just like Paul Ehrlich did in 2012 after prophesying half of the planet would be extinct by 2000. Oh he also said there would total extinction last year – did I miss something? Why aren’t these bozos more careful with what they say? I reckon they just don’t care if they humiliate themselves like so many before them? Perhaps it’s their academic “safe space” which has caused personal shame to be outdated and obsolete? I published a piece in January 2008, which places McPherson’s nonsense in perspective. “Intellectual Hysteria”– It can be Googled. I don’t remember seeing mentions of a possible link between commodity price cycles and mass delusions, but it makes a lot of sense. The professor is a fool. 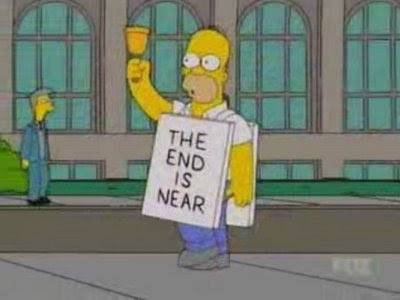 Everyone knows the world is coming to an end in nine years in 2025. So it will be scientifically impossible for his ‘ten years to the end’, to be right. While it is true that in 2005 I predicted the end of the world in 2015, that prediction was wrong ONLY because of an adding error, caused ONLY by the fact that I needed to buy reading glasses and did not have them yet — the correct end of the world number back in 2005, was also 2025. And that is conclusive proof of my consistency — the world will end in 2025 — I predicted it then, and I’m predicting it now. This professor who claims the world will end in ten years is just making up that number to get attention. Richard Greene — You sound reasonable to me. — Eugene WR Gallun. Can you please accelerate the schedule? My water hearer is unlikely to last until 2025. They have the audacity to label themselves “progressives”. I should make a bet with this guy that he is wrong. At least he will be happy that he won the bet when we are all gone in 10 years. This Guy has seen a gap in the market since Harold Camping found his end was nigh. Sounds like this guy Guy McPherson would be a grand candidate for wearing a DOOM message sandwich board in Times Square. McPherson simply believes that when he dies the world ends. We are all his dreaming and at his death the dream ceases. He figures ten years are tops for him. This is a theme found in many a book — Ursala Le Guin’s THE LATHE OF HEAVEN immediately comes to mind. Not a happy feeling that taxpayers are forced to pay for this bed-wetter McPherson. It is always amazing that some book-smart individuals have such maturity/judgement issues. If Trump is really able to defund billions of climate science nonsense, guys like this might actually be happier as burger flippers. So it is worse than we thought! MacPherson is 56 years old. He likely set the date of the apocalypse to one year after his expected retirement. He’s no dummy. KM. it was noted earlier in this thread that McPherson already took early retirement (20 years and out?). Most states allow retirement from Civil Service Education jobs at 55. Looks like a good time to snag that reverse mortgage! That’s funny, Al. The picture sums everything up perfectly. These are the same folks that told me that we are entering a global ice age and that we only had 20 years of global petroleum supplies left when I was in high school some 30 years ago? When these idiots are just down the street from me, I am SO tempted to deliver them a free sample of Jim Jones Cola… What an embarrassment. I’ve never heard of newshub.co.nz, even though New Zealand is where I live, and even though I try to access a great many news sources and opinions of all stripes. I think that in this one she covered the lot. I’m trying to understand how all these people think the earth is headed for destruction and ultimate extinction because it is “warming” by over a degree (maybe two!! ), when it has been 8 to 12 C warmer than it is now for 95% of the entire time multicellular life has been dominant. In 1975 I was told by my science Teacher that due to Global Warming by the year 2000 the UK Houses of Parliament would be under water, Holland will no longer exist as it’s under the channel and that all coast lines will have moved 100 miles inland. Well it’s 2016 and NONE OF IT HAS EVEN COME CLOSE to actually Happening. We are coming out of the last Ice Age, Global Warming is a scam and the only REAL issue is we do have a carbon problem, but if you cut down trillions of acres of Carbon scrubbers you get an Apollo 13 problem, Square Scrubbers and round holes. Just replant the Forests, problem solved. And alarmists think CO2 is a problem at ~400ppm/v. Apollo 13 reached ~1.5%, that’s ~15,000 ppm/v. He lost me when he implied that at the time of homo habilis there were practicing anarchists. Nurse, Prof McPherson’s out of bed again! Not a real scientist, a walking joke, functioning idiot. No hard scientific basis for his theory of doom. And a seriously irresponsible waste of taxpayers money. Should be struck off for scientfic malpractice. Yes, w/o a pension. How does this nonsense pass peer review, how is he allowed out in public with normal folk? Why is it even given space here? Why am I asking you? As for :“it’s locked in, we’re all going to die” : If there can be thousands of sightings of the Thylacine since the last one was supposed to have died in Hobart Zoo in September1936, then we might be reported as still around, for a Century after 2026. There are times when I just want to give up. Nothing like an article like that to restart the fires. I’m at a loss to understand, if it is really that bad why McPherson and his death cult followers just top themselves right now and be done with it … let us get on with our lives sans their ignorant whining. I’ll take my chances with GAIA! Didn’t the world end several years ago along with the Mayan calendar??? I seem to remember someone telling me that. (sarc off) Seriously, I can think of a few events that, should they happen, would end the world in the next ten years, but as far as I can figure out, globull warming, or any other sort of climate change isn’t one of them. Bout to turn 70==hope the good lord gives me another 10 just so I can see it. You really have to be senile to intentionally join the ranks of the end of world prophets. What seems really threatened by extinction is not humans, but crows. If “climate scientists” have even a smidgen of integrity left, they will eat all crows out of existence within 10 years. Another example of the failed public/government education system. It’s pretty arrogant to predict the “greatest” mass extinction ever, whether in ten or in ten million years. It’s an indication of what passes for “science” these days. There have been some pretty thorough mass extinctions. Granted, if we humans die out or revert to simian cultural norms, which seems a much better bet, without cleaning up, or at least sequestering, the toxic mess we’ve made, mammals and birds may be in trouble. But other life forms might adapt. OTOH, a lot of the responses here are illogical. If someone considered foolish predicts we’ll all die, is that evidence that we’re all going to live forever? It reminds me of the story of the guy who brings a bomb in his airplane luggage, “reasoning” that the chances are infinitesimally small that there would be two people carrying bombs on the same plane. My observation is that people are increasingly losing the capacity to reason. And I fear that that process is irreversible. When it reaches critical proportions, such as in medical labs, operating rooms, airlplane cockpits and control towers, behind the steering wheels, and at the keyboard, etc., our house of cards will collapse rather quickly and we’ll soon succumb to the poisons with which we’ve blanketed our world. I wonder if the good professor will sell me his home at a knock down price? My family will take it over in ten years. It should not be a problem because apparently everyone will be dead in ten years, so its money for nothing! Post-science science. Which will come first – Arctic ice or us disappearing? This is right up there with the non existent 50 million climate refugees and about as believable. Imagine the drama if the cubs had left it until the tenth year to win the world series. Another one of these kooky academics with their doom&gloom forecasts. How many times have we heard this brand of nonsense during the past half-century at least; yet the earth’s population keeps on increasing along with life expectancy, food production and living standards. These types of predictions need to be taken with not just a grain of salt, but with the whole box. I think we should all rejoice in the fact that he had the courage of his convictions to not reproduce. He said that he and his partner had no children. I thought the interview was a scream !!! Certainly Paul Henry was right in saying … why should I bother taking the time to talk to you. When Stephen Leacock became Professor emeritus, he commented that “e” meant “out”, and “meritus” meant “so he should be”. Sorry but I can’t take climate science seriously as anything but a threat to humanity as long as it persists in the line of it is proven beyond question. In my book every statement gives rise to a single question of can you prove it beyond any doubt to a highly questioning and sceptical audience? “Since the differences are from predictions of what is the norm was the prediction of the norm done using all the best available analysis methods on reconstruction the data particularly regarding the search for any cyclic elements.” We have cycles for weather based on positional factors so unless proved otherwise we should be assuming cyclic climate factors based on the moon’s position relative to earth and the earth’s position relative to the sun and other planets. Climate science needs to get away from the case is proven by a prosecuting counsel pre-tested to a guilt proven mindset, with a judge and jury also pre tested to total belief the client is guilty with a defence excluded as they are not qualified because we pre test for a belief that the client is guilty so any defence is not qualified to be heard. This afternoon I was walking next to Town hall Station[Sydney, Australia],and passed a small group of serious faced people in red shirts. It would appear that these were part of an international group of acclaimed Climate Scientists. Laughing families were stopping and taking selfies with the sign. I did not catch the issue. Now if both groups joined hands we might just END a little NIGHER. While I think he is a full six pack , he is missing the plastic thingy that holds it all together . More likely his mind and soul resembles the detritus of empty and crushed cans strewn on the ground in most Progressive gathering. So Professor Detritus is closer to the mark, perhaps. But even empty and crushed cans can be repurposed with the help of the Creator. In ten years’ time, if nothing has happened (and nothing will happen! ), will he shut up? Please? Sorry but it’s very unlikely. Insects are virtually immune to mass extinctions. The last one (K/Pg) is practically invisible in the insect fossil record. It is a sort of biological version of the First Law of Computer Programming: “There are always some more bugs”. Mosquitos will survive 4-5 degree increase, you wont. Do you know where the worst malaria outbreak was? Is this what climate scientists have been reduced to? If the sixth mass extinction was real there would be a list of 50,000+ species that have become extinct within the past 100 years. No such list exists. Such a list would not include species that were hunted to extinction (like the Dodo) or were lost to habitat destruction (both causes being unrelated to climate change). Can’t forget endangered desert tortoises (being trampled to death by ranchers’ cattle) that get food and water from bovine poop. Only about 100,000 of these ninja T’s left according to the USFWS. Somehow they survived the great buffalo herds. (The buffalos…not so much, but they’re still around.) Last check paleontologists estimate 90% of all animal-types preceding now extinct. Ancients must have had the hunting thing down to an art. The real catastrophic extinction event will be when we run out of CO2. And mark my words, if mankind goes carbon-less, we will run out. It’s interesting to contemplate the intersection of two sets of people: those who decry “climate deniers” and accuse them of ignoring the data; and those who claimed that the data irrefutably supported their assertion that Mrs. Clinton would win the 2016 presidential election in a landslide. He probably has a terminal illness and knows he wont be around in 10 years. Just shows that this biologist knows very little about the planets history and should stick to their own field. How does the planet warm over the next decade by about 10c? It’s really not even worth brothering with how stupid and ridiculous the reasons for this apparent claim for human extinction is. My proposal is to store our history as human mankind and what we know of our planet Earth on a stable planet before it is all gone. Already contacted NASA and Smithsonian about this proposal but no reply as expected. One of my grandnieces was worried about what was going to happen Jan 1, 2013. According to her the Mayan calendar was going end and so were we. I asked her to look at the calendar and told her there is no more room on the stone to record or predict events. No “Hot Spot”. No problem. . I think you lot have been too harsh on Em Prof McPherson At least he has thought big by prophesying the end of planet earth no less. were to apply to all the ice sheet it would take 150.000 years to melt the lot.- a little bit more than the decade forecast. That’s a lot of ice cubes . Climate Alarmist from the Al Gore School of complete BS . The truly sad part is students and their parents actually pay money to listen to losers like this . Can we expect a book at Christmas ? Another Climate Clown looking for attention…. so the bigger the whopper the better . quality of life on earth . Dump the Doomsayers who are never held accountable for anything . The good news is that this clown is only 56 years old (a retired professor at only 56? – seems lacking in professionalism to me), so he stands a very good chance of living to see himself humiliated by a reality check. Thank you Eric: always good to read your comments about these bedwetters. Their Great Global Warming Gravy Train will be hitting the buffers very soon if Mr. Ebell has anything to do with it. The arrogance of this so-called professor (retired) is bewildering and don’t ya know; it always seems to be in “ten (10) years” that doom will occur: why ten years I question ? Why not eleven (years) and thirty-one days ? Hey ho. At least we now know that WUWT is read by important decision makers, so we can expect to see and hear the rats as they try to leave their sinking ship. The comments above are very entertaining, more so than usual. Many thanks again. Well, he obviously has gone emeritus. See definition of “emeritus” in “Languages of Pao” by Jack Vance. Maybe the alarmists, whose golden goose is about to be roasted, will first to go. To be fair, it’s better to die trying than just waiting for death. Trying to do what, “control” climate? So better to die beating your head against a wall? Got it! You don’t have to “control” climate. There is realism but you can stop or reduce things that affect the climate. Making some change is better than doing none. You sound pretty defeatist. Even the most ardent AGW scientists, in a moment of candor (and actually in print in the IPPC reports) admit that reducing CO2 output to pre-industrial level *immediately* would only lower global temperature a fraction of 1 deg C over the next 100 years. And that, of course, relies on the same theoretical models that failed to predict the 20-year “pause”. None of the young snowflakes entering college today have experienced any significant warming in their lifetimes. I hear the wailing: “But, we have to do SOMETHING!” No, we don’t. Not if the most draconian “something” imaginable would have, at best, a negligible effect on natural climate change, and revert human existence to subsistence in caves, for those who survive the collapse of modernity. So you are saying that all of this is natural? Funny how the figures provided by agencies such as NASA can be wrong. Not funny. Tragic. Look at any graph of historical global temperatures. You do realize that technically we’re still in the tail end of the most recent glacial period? The world has been warming for a very long, and thank God for that. But it has naturally been a lot hotter in past interglacial periods. Please don’t invoke the tiresome logical fallacy “appeal to authority” (NASA). Recall that for decades 97% of medical nutrition “experts” agreed that eating eggs and butter was akin to slow suicide. Last week my doctor told me to eat all the eggs and butter I like, and not because I have low cholesterol, I don’t. It’s just that eggs and butter aren’t the culprits, most experts now agree. In fact, many now question the cholesterol number itself actually predicts. And after decades of “fat kills” many are now admitting a low-fat diet can be dangerous for the heart. Genetics trumps dietary components and lifestyle factors. Anyone saying that twenty years ago would have been labeled a “fat denier” and laughed out of his field. Meanwhile, a trillion-dollar low-fat food industry clings doggedly to the “fat kills” narrative, which is analogous to the “CO2 is a dangerous pollutant” narrative the EPA hangs it’s planet saver hat on.